In China, when you go to the tea market in the winter, everyone has their own herbal remedies to keep you healthy. Many of our friends have been telling us to make a tea that incorporated all the ‘super ingredients’ used in traditional Chinese medicine. As a dare, we took up the challenge of incorporating all of the most beneficial herbs and flowers in a way that yielded a rich, complex and delicious brew. This is the result of our experiments. Our Ginger Sage Winter Spa Blend is the perfect balance of rich tulsi, spicy ginger, savory sage, earthy burdock, sweet rose petals, tart lemon peel, rhodiola, and of course elderberry and goji berry. The combined flavor is very warming and soothing- perfect for sipping in a big mug with a blanket. This tea is also excellent with a touch of honey to sooth the throat. Goji Berries, used generously in this blend appear in Shan Nong’s original encyclopedia of medicine, where the legendary emperor claims a tonic effect and benefits to longevity. Tulsi, also known as Holy Basil is named for a revered goddess, and is respected for its warming adaptogenic properties in Ayurvedic medicine. Rhodiola, known since biblical times was chewed by the Vikings for strength and stamina on long sea voyages. Elderberries are rich in vitamins A, B, and C, used for centuries in European folk medicine and wine-making. Burdock Root is one of the most-prescribed herbs by our Chinese herbalist friends, especially to fight against colds. Lemon Peel is a rich source of vitamin C.
Ginger is used in Chinese medicine for aiding digestion and for its general warming qualities. In the cold weather, our friends in China always tell us to chew ginger to stay healthy. Rose petals were prescribed to us in Chengdu by a farmer of Emei Mountain green tea for a particularly nasty cold. Her rose petals really worked! Sage, used in European medicine for hundreds of years, is the extra ingredient that brought this blend together for a well-integrated taste. IT’S HERE!!! Yes, this note is to this tea, but also my anxiously awaited YIXING POT! It’s BEAUTIFUL! I cannot get over the delicateness of it, how small and amazing it looks! I would love to season it tonight, but my darn presentation is tomorrow, and I am definitely not in the mindset for it, I want it to be special and I want to be free of all worries. I will be tomorrow thankfully, so I will season it then! I think I managed to include a picture in the comments. Anyways, onto this tea review now! The dry smell of these leaves is very heady! I get a lot of the sage and ginger, and definitely a bit of burdock. It’s very spicy smelling. The blend of herbs also look absolutely beautiful, a myriad of petals and colors, it looks as if it has been crafted in a far away land. The wet smell is at first very rose! Like a lovely perfume of it, with underlying scents of spice. I brewed this between 3 and 4 minutes, don’t know the exact time. The liquor is a light yellow color, and once the leaves are removed, the rose smell has been muted, and the spiciness is replacing it. This smells VERY healthy and like it will destroy any cold virus in its path! Mmm the spiciness is almost intoxicating! Oh this is SO NICE. Perfect calm. It’s a very light tea, was not expecting quite so light after the aroma. The ginger is there, and I love ginger so this is excellent, I think I’m tasting the basil in there too (never have had Tulsi) and definitely some lemon. And a sage-y aftertaste, and a small hint of sweetness, probably the gogi berries and rose mixing maybe? I am very tempted to add a bit of honey like Bonnie did, just to see what happens. I am going to drink this cup straight first though for a bit, and maybe add it at the end, or have it in the next cup. Overall, this is very good. Very light, and caffeine free to boot, I can see myself drinking this quite a lot. I’m happy I got 2 ounces haha, as it seems like a good evening tea, and especially good for if my throat is sore or I am sick to my stomach or basically anytime. Also would be interested to try mixing it with some of my Laoshan green or my little bit of Laoshan Black that I have left (might save that though). 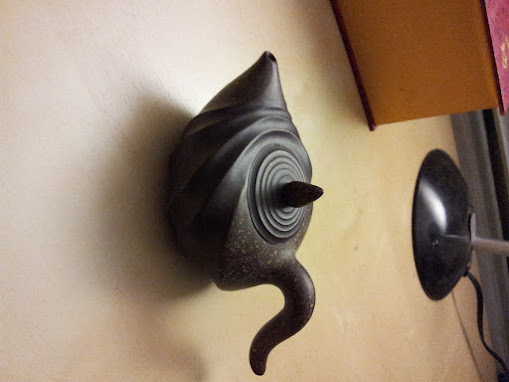 Thank you Verdant for another wonderful blend, and also for my teapot!! ETA: Ok, I added a wee bit of honey near the end of the cup – the flavors seemed to come out a little bit more maybe. Hmm, I will have to try adding honey right at the start when the tea’s a bit warmer to see the results. https://lh3.googleusercontent.com/-JFwPqaqd0GM/ULbNNl1WYeI/AAAAAAAABxE/Z6RdF4KM7_g/s509/20121128_191329.jpg Hopefully this link works! How beautiful! That is a lovely pot. Thanks! I can’t believe how pretty is it :) I can’t wait to try it out! Oh good grief, you got the beautiful ripple water pot!!! I loved that one!!! Yay for you! I’m sorry I stole it from you Bonnie! I couldn’t resist :) it’s so unique! I’m very happy with it! That is one of the ones I was drooling over too!! By the time I was the page, they were all sold! Congrats, Lena, it is SO beautiful! Hey Terri, get her address, we know who to rob! Wow, nice teapot! It’s beautiful! You sounded like me there in the beginning of your post, going on about the new teaware rather than the tea! Haha yeah oops lol i had to rave about it I had been waiting soo long for it! I can’t wait to season it tonight!! Right before David Duckler jetted off to China, gathering more tea for Verdant and to see old friends, he added this new Alchemy Blend. It seems that this kind of herbal blend is what you might find in Chinese tea stalls this time of year when people begin needing a remedy to boost their immune system. When I saw this blend, I bought a packet for me and one for her. Another thing that really intrigued me was what I read about how you could customize this blend by adding your own tea to it. You could add Black Tea, Green Tea or Pu’er and create a custom flavor blend you like. I knew what I was going to blend first for as my favorite. I just had to give this a try! Today my herbal blend arrived! Off to the business of experimenting! First I made a straight brew. You can’t tell by sniffing the dry tea how it’s going to taste so don’t be put off by the strong smell. The actual liquor was soft and slightly sweet with a light lemon ginger taste. (Very light on both) Even the sage was light tasting and added a pleasing warmth that I liked. I was thinking about how and when I would drink this blend. Before bedtime and if I wasn’t feeling well. I’d brew it longer though if I had a cold, and add honey. Aha! Honey was missing! I added some clover honey and it was meant to be! The blend was outstanding! The sage, ginger and lemon tasted lovely with the honey and were soothing in all the ways you want an herbal to be. Fabulous! For the next test, I made a whole POT of tea+blend with a teaspoon of Laoshan Black and a small little nugget of Pu’er. For those of you who love the Emperial Breakfast Summer Blend…just imagine a slight ginger and lemon added and BAM! WOW! This was so good! I can’t imagine this being any better! I mixed up a little Laoshan Green (probably too little green tea) and got a spicy reaction that was unexpected and a camphor sensation. I’ll have to try that one again. The best, awesome taste for me was the Black Tea and Pu’er but you could really experiment and see what you like the best! I LOVE this idea. My kind of BLEND to KEEP on hand all WINTER! LOL, Bonnie! I love your review! Mine also came today & I had a cup, with will probably wait until tomorrow to write a review on it. This is incredibly gingery tonight. Really delicious, especially since I gave into the talk about pancakes and ate too many pancakes for dinner. I was so jealous of everyone’s talk about pancakes… I had to do a major grocery shop at night, so there were no pancakes for me… pannnnncakes! Honey on the pancakes or in the tea? Tea. I had maple syrup on the pancakes. Ooh I bet maple syrup would be good in the tea too! I only have one serving of this left and I’m super sad! My fave herbal blend of all time…will definitely be re-ordering ASAP. Wonderful winter evening drink. I’m not going into much of a detailed note on this one as I see that there are a few reviews that go into pretty good depth with it. I will say that when I first tried this tea I was not impressed. I didn’t care for it at all and was ready to give it away. I tried Bonnie’s advice and mixed it with a puerh. That helped a little bit, but I still didn’t care for it. Over the weekend my husband got sick and has passed it onto me. I started drinking this last night. I did it western style. I put a generous amount of farmers market honey at the bottom of my cup and proceeded to brew this. This my fellow Steepsterites, this is the nectar of the gods when you are sick. It tastes so much better, it makes me feel a little bit better even though I know I am not. And the nice amount of honey sitting in the bottom of the cup that hasn’t mixed in is just delicious. I get the feeling I may finish this before I have the chance to pass it off! I’m leaving the rating off of it because I don’t like it when I’m healthy, but it’s good when I’m sick…so I’m not quite sure how to rate it, so I’m just leaving it off. When you read the notes on this, it’s what the Chinese create for just this occasion (If being sick is an occasion!). I think that the way I brewed mine with additions was to add some Laoshan Black (a pinch) and a small nugget of hard puer (for any of you who like Summer Imperial Breakfast Blend you get the idea of how this works) to the Ginger Sage per your measurement by the pot I’d say. Good for the stomach. Rachel, I find it oddly amusing that the only time I get sick is when he gives it to me! But a week of sniffling, sneezing, runny nose, achy body, and headache isn’t that bad compared to the rest of the year! Bonnie, I unfortunately don’t like black tea, nor did I like the Breakfast Blend, so I just stuck to puerh. But I will say that honey really does help for me. I didn’t think of making this by the pot…I don’t typically brew that way, but today that’s what I’m going to be doing! TeaFairy, yes, this really does stand up to the occasion! Thank you! OH YES! You’re the alien black tea hater! I forgot! I’m the alien flavored matcha ‘not gonna buy any’ person! OOPS! Haha, I’m not a huuuuge fan of black tea either. It’s not bad, but it often leaves me underwhelmed. I don’t mind it in flavored blends, but on it’s own it’s rough. I’m still searching for an amazing black tea to knock me off my socks like green tea. Yes Bonnie I’m the alien black tea hater! I try some out from time to time to see if my tastes change, but no luck. Although, I think with all the other wonderful teas in the world, I’m not really upset about it! Rachel, I haven’t even found a blended one I like. I’ve tried a few that are blended with green tea and that doesn’t even help. But I’m happy with all my other teas in the world! Are you saying that you haven’t even found a flavored black you like? Like a strawberry black or desert tea? Nope, I haven’t found anything I like. The only tea that I found that contains black tea that I enjoy is the Chocolate Phoenix Chai from Verdant. I’ve tried the Dancong Black by itself since I liked that blend and I like dancong oolongs, but no go. I’m still missing the 2 oz bag of sichuan caravan. I know I bought it a month ago, I know I haven’t drank it yet. I’ve looked through all of my tea shelves, boxes, etc & it is nowhere to be found. I’m pissed. Today is a day that I know I would really benefit from that tea. So I’m drinking this instead. It has a lot of good & healthy things in it. I want caffeine too, so I mixed in some Laoshan Black (you don’t want to know how much). I’m gonna make a cup of this to go, & some decadent black tea also. The funny thing, as soon as I order more it will show up, right? Of course, that’s how it always works! Hope you find the missing tea soon – hugs! The dry tea is beautiful to look at. Peices of chopped sage, ginger and tulsi, gogi berries, flower petals. The dry tea smells strongly of sage and ginger. The tea brews a light, but bright yellow liquid. It smells of sage, tulsi basil and tart lemon. The taste is very strong sage and ginger. There is a tartness to it, which might be the lemon or gogi or both. I am also getting a very strong taste of the tulsi basil, and it tastes a bit salty to me. I got this same taste with Verdant’s Holy Basil Spa blend. The rose is helping to make the tea very smooth. Definitely is a warming tea. I think it would make a great stuffy nose tea for sure. However, I would like to try it iced as well. At first, drinking this tea surprised me. I was all, “what is THAT?” with the first few sips, and put it down because it seemed so darn odd to me. I’m thinking it was the sage, but really, I’m just guessing. Now that it’s right cooled, it’s an amazingly delicious cup – little to compare to those first few hot sips. Sweet and savory, herbal licorice and berryish, I quite like this, and can see myself drinking it often. Another tea staple worth playing with. I prefer a bit of honey in this one and sometimes I put in a pinch of laoshan black. Ehm…. this one’s just a liiiiiiittle too weird for me. And my mom. I knew as soon as I opened my (thankfully) sample packet that it was not going to be my thing. It smells quite spicy, and a weird sort of savoury that doesn’t appeal to me. Can’t say I’ve ever had sage in a tea, so that could be part of it, although there are a few “new-in-tea”-to-me ingredients lurking in here. My mom thought it tasted much like drinking liquid turkey stuffing. She thought perhaps it would taste good consumed alongside a turkey meal. I… thought it tasted less spicy and less strange than it smelled, but… definitely savoury, and rather weird. Both of us did agree that the aftertaste is quite pleasant, once you get past the sipping and swallowing stages! I think it may be the ginger that leaves a nice spicy aftertaste. I think I can get why people mix this with a pu’erh or something, but I just don’t think this is something that’s going to appeal to me in any form. Just too strange. I like it, but I can see how it would be weird for some people. It kinda reminds me a Italian food personally. Yeah, I’m wondering if I don’t care for tulsi. I honestly haven’t ever tried it on its own before! I do have a sample of 52teas’ Tulsi-rama in my box of teas from LiberTEAS, so perhaps when I get back home I’ll dig that out and give it a shot. LOL liquid stuffing. I so wanna sample this now if you don’t mind! Well, I only got a sample size…. but as luck would have it, I don’t want the rest!! Ahaha, I’ll save it for ya. Better add to the swap list! I’ve got to say that if you removed certain things from most of the alchemy blends they would taste strange. This is why adding Laoshan Black and a little puerh brings this blend somewhere close to the Summer Imperial Breakfast Blend with a little extra ginger (in my opinion). Sort of a magical thing that happens…and I like it! Plain, adding honey transforms the flavor into a more delicious cup. Bonnie, you are a tea mixing master!! This is one that the beau really wanted to try but I was hesitant about. Once I received it and smelled the dry leaf, I remained hesitant and the beau became a little more cautious. Last night we finally steeped it up and it turns out, neither of us likes it. I can’t adequately describe the taste other than medicinal. There is some ginger and lots of herbiness. It’s more savoury than I am used to and has too many ingredients, many of which I am unfamiliar with on their own so it becomes a jumble of tastes all at once. If I can remember it when I am sick I will drink it then. Otherwise, it is not for us. The smell put me in mind of a foot lotion from Lush. Yes, kinda smells good. No, I don’t want to drink it. I think it will probably help when feeling poorly but other than that, blech. Sorry Verdant! Really, the best way to think of this would be as a base. Use some with a tea (I like laoshan black with it but I’ve tried green tea also). Plain, I prefer using honey…like chai. Drinking it straight…Not so much. I don’t mean that I don’t like it straight, but just not without honey.